The Ellis L. Phillips Foundation has developed an institutional predisposition to be entrepreneurial and innovative in its work. The seed of this growth almost certainly was planted by the founder, Ellis L. Phillips, an engineer who made his fortune by creating innovations in electric power generation and distribution and then building successful businesses on the strength of them. 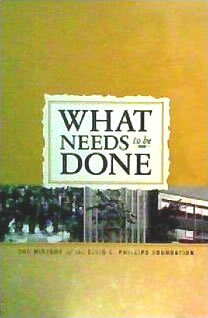 His son, Ellis L. Phillips, Jr., recognized that the Foundation might have a greater impact for good by actively applying its resources to identify needs and create solutions, rather than passively relying on the initiative of supplicants who managed to find their way to the Foundation's door. Ellis’ grandson, former President Larry Phillips, and great grandson and current President Hardy Watts, have sustained this tradition and continue to make grants that act as a “spark” and a “multiplier for innovative projects and ideas.